The Darien Community Association Thrift Shop was founded in 1931 to meet the needs of a community severely affected by the Great Depression. 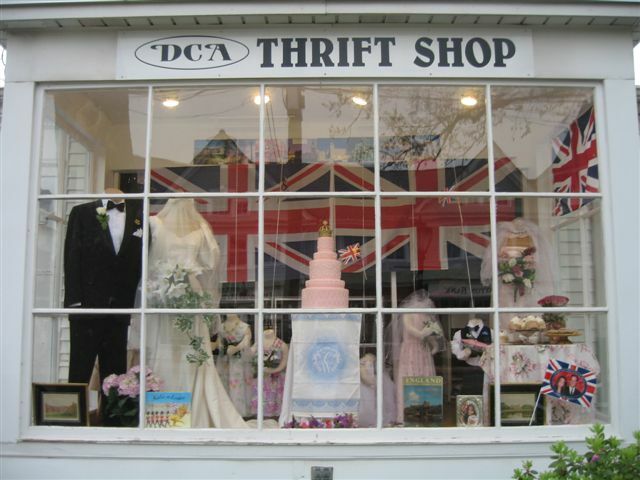 Today’s Thrift Shop continues this proud tradition of serving the needs of Darien and its extended community and of also contributing to the DCA’s commitment to philanthropy and scholarship. The shop features just about everything and anything….and all at very affordable prices! The success of the Thrift Shop depends on donations of quality items and the tireless efforts and dedication of the volunteers. Recent Finds: Clark’s Desert Boots ($12.00), Brooks Brothers buttondowns ($4.00 each), Ralph Lauren winter vest ($6.00). The Salvation Army is an evangelical Christian organization that devotes billions of dollars and thousands of volunteer hours each year to disaster relief, social services and other charitable causes worldwide. With proceeds going directly to adult rehabilitation centers, the Army’s many thrift stores play an important role in furthering the organization’s mission. Patrons of the stores pick through a diverse selection of moderately worn clothing, as well as second-hand furniture, electronics, books and toys at bargain prices. Recent Finds: Burberry tweed sport coat ($9.99), Corbin houndstooth sport coat, English style with two front pockets and a ticket pocket ($9.99), Lands’ End button downs($4.99 each). Housed in a building from the 1800s—one of the oldest in New Canaan—this thrift shop has been in business since 1930. The non-profit business offers a variety of high-quality second-hand items from clothes to home decor to furniture. The thrift shop is very involved in the community, donating merchandise to people in need as well as to fundraisers and providing costumes and props for high school plays. Handicap Accessible: There is a ramp in the back. Return policy: All items are final sale. Donations policy: Items must be in great condition. If you are donating for a tax return, come with a list of items. Recent Find: Brooks Brothers 3-button charcoal gray wool suit with light gray chalk stripes, 3/2 roll on the lapels and plain front pants with cuffs ($75.00, but totally worth it considering that this suit runs upwards of $1,000 in the retail store).